It’s the start of something both new AND old today at TwoMorrows. We debut Comic Book Creator, Jon B. Cooke’s sequel to Comic Book Artist, our multi-Eisner Award-winning mag of years gone by. 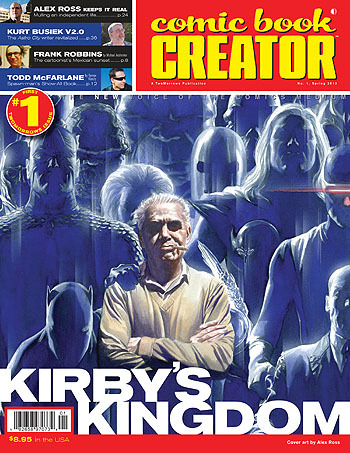 Jon’s knocked himself out on the first issue, which is (in typical TwoMorrows tendency) Kirby-centric, with a career-encompassing look at Jack’s highs and lows, plus interviews with both Alex Ross and Kurt Busiek on their own Kirby-centric work. We’re also offering a free Bonus PDF, which is 32 pages of all-new material that wouldn’t fit into the first issue. You can download it at this link, and it serves as a nice sample of what you’ll find in CBC #1 proper. I’m confident you’ll love what you see, and Jon’s already completed issue #2 (a double-size book tribute to Joe Kubert, debuting in July at Comic-Con), and he’s completed all the interviews for issue #3 (which leads off with a lengthy interview with Neal Adams, where he responds to critics of his recent Batman: Odyssey mini-series, among other things). We’re dubbing CBC “The New Voice of the Comics Medium”. And as of today, we’re ready to unveil that new voice. Enjoy! And order issue #1 here. This entry was posted in TNT on 10 May 2013 by Mr. Morrow. Sorry, Comic Book Creator #1 and American Comic Book Chronicles: 1980s subscribers. The issues have been printed for over 40 days, and shipped here from our overseas printer (it takes 45 days or more to ship be sea freight, to keep our costs to you low). Diamond even has them in their warehouses now, and they’ll be in stores soon. But the delivery company that brings us our subscriber copies from the US port they arrived in, had truck problems all week, and haven’t been able to get our copies delivered to us. They should have them to us no later than Monday (maybe today), and we’ll immediately start getting them in the mail. Thanks for your patience; both great books that’ll be to you soon! This entry was posted in TNT on 3 May 2013 by Mr. Morrow.